Sunglasses and other mirrored shades that are not scratch resistant can end up with marks and scratches on them that can be unsightly and make viewing difficult. If sunglasses or mirrored shades do get scratched, there are a few methods to help minimize and remove the scratches using some household items. Purchase an etching compound at craft stores or hardware stores. One brand name is Armour Etch. Pour some of the etching compound on a clean, soft cloth and smear a thick layer on the sunglasses over the scratched area. Rinse the sunglasses off with cold water. 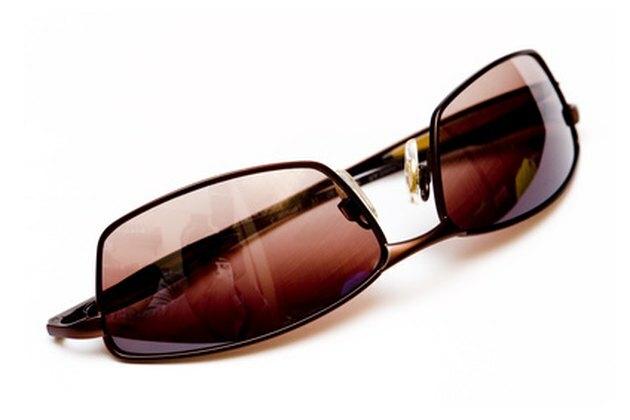 Try spraying furniture polish on the sunglasses over the scratched area and rub in gently with a clean, soft cloth. One name brand of furniture polish is Pledge and can be purchased at most drug stores or grocery stores. Clean off with a few drops of dishwashing detergent and rinse with cold water. Spray liquid adhesive on the scratch, such as the name brand Band-Aid, which can be purchased at most drug stores or grocery stores. Wipe off any excess liquid and allow the liquid to dry completely. The liquid adhesive will fill in the scratches on the lenses. No rinsing is necessary. Apply some toothpaste on a clean, soft cloth. Wipe in circular motions over the scratched area. Continue until the scratch is gone. Rinse with cold water. Mix one tbsp. baking soda with a small amount of water until a thick paste has formed. Wipe the paste onto the scratch with a clean, soft cloth and rub in a circular motion. Rinse with cold water.